Syrian government and Russian forces are reportedly attacking an enclave held by the jihadist group Islamic State (IS) in south-western Syria. Activists and a monitoring group said aircraft were bombing the Yarmouk Basin area, which borders Jordan and the Israeli-occupied Golan Heights. The militants are said to have counter-attacked, targeting nearby villages. 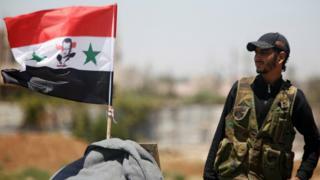 The fighting comes after the government recaptured most of the surrounding province of Deraa from rebel factions. Rebel commanders agreed on Friday to surrender their heavy weapons and begin handing over towns as part of a Russian-brokered agreement. In return, the Russian military is believed to have guaranteed the safe return of the 320,000 civilians who fled their homes after the government's offensive began on 19 June, as well as the evacuation to rebel-held parts of north-western Syria for people who wish to leave. An IS-affiliated group, the Khalid Ibn al-Walid Army, has controlled the south-western corner of Deraa province since 2014, when jihadists overran vast swathes of Syria and neighbouring Iraq and proclaimed the establishment of a "caliphate". IS was not covered by last week's ceasefire deal and on Wednesday its positions in the Yarmouk Basin was subjected to air strikes and artillery fire. The Syrian Observatory for Human Rights, a UK-based monitoring group, said Russian warplanes had targeted the town of Saham al-Golan early on Wednesday and that government helicopters had also dropped barrel bombs on the area. In retaliation, IS militants attacked Hait, a rebel-held town that recently agreed to return to surrender, it added. The pro-opposition Horan Free Media group reported that IS artillery fire killed four children and a woman in Hait. Syrian state media meanwhile reported that troops were advancing towards Tal al-Ashari, Jallain and Zaizoun, rebel-held villages in Deraa's western countryside that have agreed to surrender. On Tuesday, IS claimed it had carried out a suicide bombing in Zeizoun. An IS statement said the attack had targeted a gathering of Russian and Syrian troops, killing more than 35 of them. But the Syrian Observatory said the attack put the death toll at 14 and said they were soldiers and rebel fighters "who recently reconciled" with the government. Thousands of civilians have reportedly fled the Yarmouk Basin in anticipation of a government ground assault and headed towards the frontier with the occupied Golan Heights, which Israel captured from Syria during the 1967 Middle East war. Up to 190,000 people displaced by the assault on rebel-held areas are also gathered near the armistice line, according to the United Nations. Many do not have any shelter, leaving them exposed to harsh weather conditions, such as dusty desert winds and high temperatures. The Syrian army's advance towards the occupied Golan Heights has also alarmed Israeli officials, who believe it may attempt to deploy soldiers along the frontier in defiance of a 1974 Separation of Forces Agreement that created a buffer zone patrolled by UN peacekeepers. On Wednesday, the Israeli military said it had launched a Patriot missile at a drone launched from Syria, setting off air defence sirens in Israeli communities. Israeli Prime Minister Benjamin Netanyahu meanwhile flew to Moscow to discuss "Syria, Iran and Israel's security needs" with Russian President Vladimir Putin. Iran, Israel's arch-enemy, has deployed hundreds of troops to Syria, ostensibly as advisers to the government. Thousands of Shia militiamen armed, trained and financed by Iran have also been battling rebels alongside the Syrian army. Mr Netanyahu has vowed to stop what he considers Iranian "military entrenchment" in Syria and has ordered a number of air strikes on Iranian facilities.